Reactor physics is the discipline devoted to the study of interactions between neutrons and matter in a nuclear reactor. 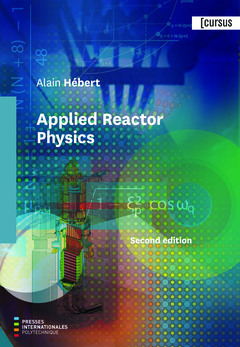 In Applied Reactor Physics, reactor physics is approached from the fundamental level. Legacy numerical techniques are introduced with sufficient details to permit their implementati on in Matlab. More advanced and/or proprietary techniques may be available in a production environment, but these can be obtained as evolutions of the fundamental approaches presented in the book. A characteristic of Applied Reactor Physics is to emphasize the algorithmic nature of numerical solution techniques used in reactor physics. Many numerical soluti on approaches described in the book are accompanied by Matlab scripts and readers are encouraged to write short Matlab scripts of their own in order to solve the Endof-Chapter exercises. This book is dedicated to an audience at the graduate level, without preliminary knowledge of reactor physics. It was initially writt en as support for graduate-level courses offered in the regular program of the Institut de génie nucléaire at École Polytechnique de Montréal. Enough material is included for constructing three or four graduate courses. Alain Hébert, has been a professor of the Institut de génie nucléaire at École Polytechnique de Montréal since 1981. From 1995 to 2001, he worked at the Commissariat à l’Énergie Atomique, located in Saclay, France. During this period, he led the development team of the APOLLO2 lattice code, an important component of the Science™ and Arcadia™ packages at Areva. Back in Montréal, he participated in the development of the DRAGON lattice and TRIVAC reactor codes, both available as Open Source soft ware.